From 27 October to 20 November the exhibition 'MEDIA LANDSCAPE, ZONE EAST', which was first seen at the Liverpool Biennial 2010 before coming to London, highlights the aspects of Asian Media Art. Within a new installation, the same artworks from the Biennial will be shown in a different format at the Korean Cultural Centre UK. 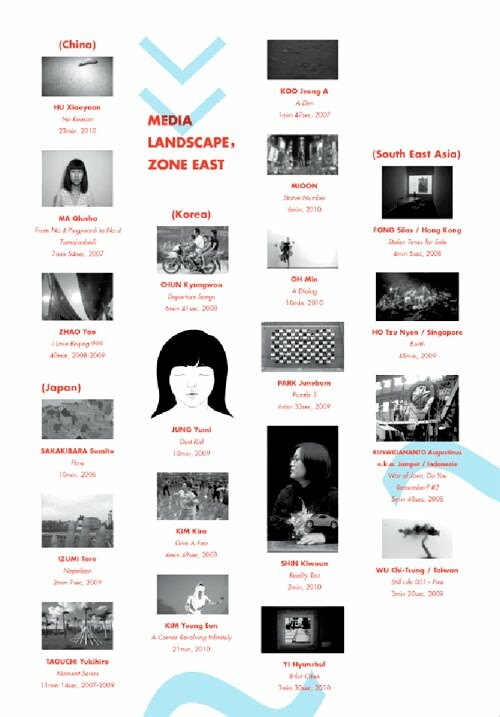 'MEDIA LANDSCAPE, ZONE EAST' represents a group of internationally working Asian artists from Seoul, Tokyo, Beijing, Taipei, Singapore to New York, Bremen and London. The Korean Cultural Centre UK (London) and Alternative Space LOOP (Seoul) representing the Republic of Korea, have invited ten internationally working Korean artists and have nominated ten other artists to join the project. While all these artists come from Asian cultures, their stories encompass both their hometown identities and their new discoveries from across the world. These moving images stimulate associations with the rapidly developing cities across Asia - 'Zone East'. The images change their pictorial representation every 1/24 second and force the viewer to engage in the changing scenery. This situation itself resembles Asian cities that have witnessed rapid growth. Artists originating from Asia are immune to this rapid change, and are adapted to the total visual transformation of their environment in a short period of time. When it comes to deciding means of artistic expression, it is only natural that Asian artists have no reservation about choosing media art, especially moving images. With this exhibition, viewers are able to explore the notion of a virtual reality and Asia’s rapidly developing contemporary art scene. The exhibition is curated by Stephanie Seungmin KIM (KCCUK) and Jinsuk SUH (ASL). Other participating curators (nominators) are Eugene TANG and Leng LIN.